This recipe is for “ready to eat” or “fully cooked” hams—not fresh hams. Try to buy hams that have been minimally processed, preferably, bone-in and unsliced with a nice cap of fat. 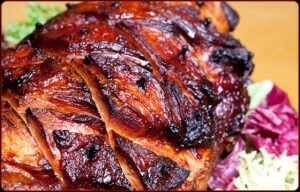 Arrange the ham on a rack in a roasting pan. Pour the apple juice or in the bottom of the pan. Place on the BBQ and close the lid. 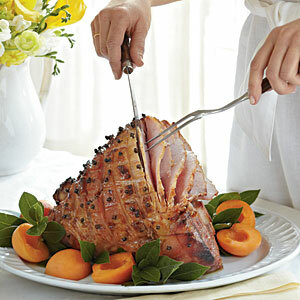 Timewise, allow 15 to 18 minutes per pound for a half-ham, and 10 to 15 minutes per pound for a whole ham. Meanwhile, in a small saucepan over medium-low heat, melt the apple jelly. Whisk in the mustard, bourbon, lemon juice, and ground clove and remove from the heat. Brush over the outside of the ham 40 to 50 minutes before you expect the ham to be done. Let the ham rest for 10 minutes before slicing and serving. Reheat the remaining sauce and pass it separately at the table. This entry was posted in Easter, Ham, Thanksgiving and tagged apple, bourbon, easter, glaze, Ham, Roast, Thanksgiving. Bookmark the permalink.